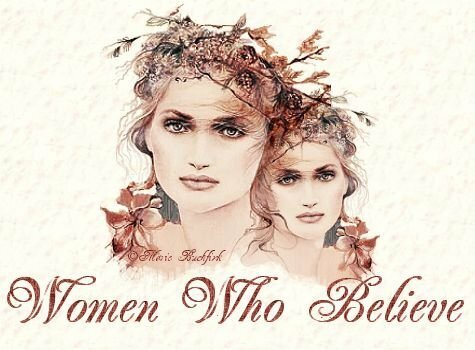 These are the following Committees that we have available for the members of Women Who Believe. The PenPals committee has been designed to allow our members to get to know each other in a more personal way. We will send you a new penpal each month to give you a chance to meet all our WWB members. The PSP Committee has been created to teach all our members how to use Paint Shop Pro and create the images and graphics that we see all over the net. You will have PSP lessons that are scheduled to meet everyone needs and time zones.. as well as different levels that you will learn. If this sounds like a committee you would be interested in, just click above to let your creative side come out. Welcome to the Recruiting Committee. This committee and it's members go out on the net and look for suitable sites and women to join our group. We love to have members from all over the world and if you would like to help us recruit new members, just a couple hours a month, then please join us. What is the ROSE Committee you might ask... easy, ROSE stands for Remembering Our Sisters Everyday! Whether a member is celebrating her birthday, anniversary, new baby or has lost a loved one. WWB ROSE Committee is committed to helping her celebrate or be there for her. If she is down, blue or just needs a little pic me up, that's what ROSE is for. To be a member of the ROSE Committee you must like to make pages, email cards or send a special gift to a fellow WWB member who may need one. Please feel free to visit us more to see what we are all about & join us today! What this committee has to offer is welcoming any new member to the group by leaving warm welcoming gifts in their guest books or by leaving a nice gift, card, or letter in their email. If you are interested in joining this committee please click the link above. This is a brand new committee. By joining the newsletter committee, you will be helping all of our members find out what has gone on in the WWB over the past month and upcoming months. There are several sections of the newsletter to work on so please, be sure to check out this committee. Looking to give your personal site a new look? Need a gift for a friend and cannot make one yourself? The Graphics committee is designed to help all our members who cannot or do not have the time to create all the wonderful images we see on the net today! Be sure to stop in to see what we have to offer. This is our Awards committee which offers something fresh and new. Not only will this committee be sending out awards to our general members, we will be presenting awards to other groups on the internet. If you would like to nominate an award or join this committee please click to see what more we have to offer. We are a Committee dedicated to writing. The Lounge offers a wonderful place where all our writers can come together and share their stories, poems and other works they have written. We encourage anyone who likes to write to join this committee. Let your talents shine through your creative writing. Everyone loves to see online quilts. Threads Of Friendship is a brand new committee designed to bring the internet wonderful quilt idea's that show our support for many things. If you like to create quilts then this is the committee for you. Would you consider joining us? Don't know what to make for dinner? Do you have your *Mother In-law* coming over in just a few short hour's. Well look no further. The Recipe Box has a wonderful array of fresh idea's that will tempt the taste bud's of even the pickiest of Mother in-laws. ;o) This is a committee designed to allow us to teach HTML to our members as well as set up web sites for members who wish to have one but currently do not. We will begin by teaching basic HTML so members can maintain their own web sites and do the basic things to create one. If you feel you could assist in this committee, please visit us. Chatting w/MsPaulie is a special section we have. A member is interviewed once a month and she shares more about herself with the members of the group. Interviews are posted for our members to read. :) it is a fun and unique way of getting to know who we all are.